Free Printable Canada Day Crossword. Free Printable Canada Day Crossword Puzzle, a free printable game to have fun at the Canada Birthday celebration on July 1st. Use this Crossword to learn more about Canada Day. Print it free using your laser or inkjet printer and have fun solving 12 Canada Day related questions. Let’s see how much you know about Canada Day. Find Canada Day related words like Dominion Day, New Brunswick, Anniversary, Flag, Parade, Picnic, Colonies, Festival, Fireworks and more. Includes answers on page 2. 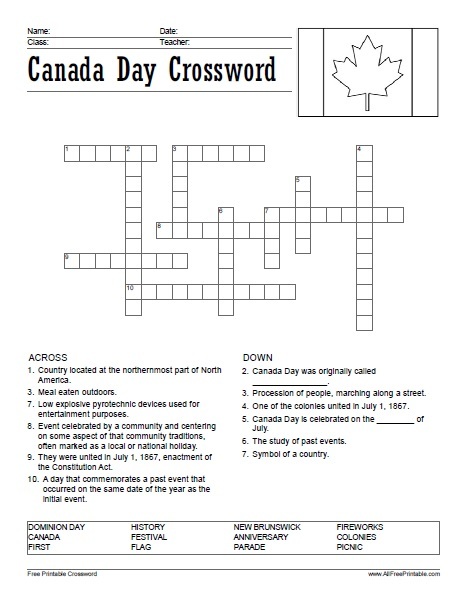 Click the link below to download or print the Canada Day Crossword Puzzle now in PDF format. Happy Birthday Canada!